Day 1; Arrive Kigali Airport. Moderate; The luxury hotel, gorillas’ golf hotel. Day 4; Transfer to Nyungwe National Park. After break fast, you will drive to the Bugarama hot water springs which is the largest and biggest natural spring in Rwanda passing via Cyamudongo natural forest. You can have a warm bath in the hot springs if time allows but this must be Pre – arranged. We will later drive to River Rusizi for a day trip with lunch and then later transfer to Kibuye town. After breakfast and you will go for a nature walk along the shore of Lake Kivu and then take a boat ride along Lake Kivu, have lunch later on. In the afternoon, you will travel to Parc Des Volcanoes that is where you will have you dinner at either. Budget; Hotel La Palme/Muhavura Hotel / Kinigi guest house. Day 11; Golden Monkey Trek. Day 12; Dian Fossey Tombs Trek. Day 14; Descend and transfer back to Kigali. You need to wake up early and descend from very top of Mt. Karisimbi. You can always take photos of the beautiful scenery and friendly plants. 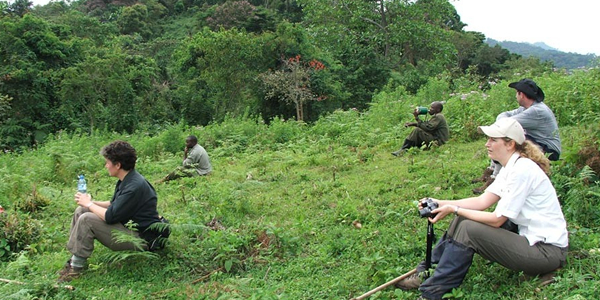 Descending down the volcano may take about 6 hours and then your guide will be there to transfer you back to Kigali. 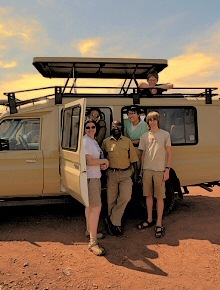 End of Rwanda Safaris with AA safaris and Tours Ltd.